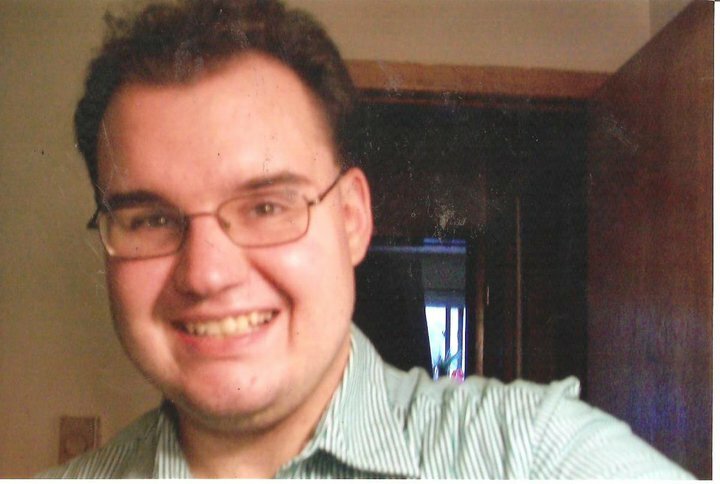 Matthew Turcotte is a soon to be 31 year old aspiring writer from Brockville, Ontario. He works by day at Walmart and diligently by day and night at home preparing his pop culture blog, of which he produces one a day. We discussed his roots, how and why he has managed to produce one blog a day for more than a year, his future writing goals and a variety of subjects that he blogs on regularly. You live in Eastern Ontario. You were born, raised and have always lived there? Yes. I was born in Brockville, Ontario, and have lived in the area all my life (barring a two year window where I attended school in Ottawa). 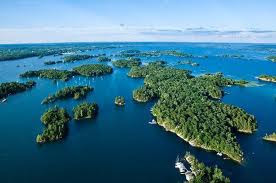 Brockville, Ontario gives you access to the Thousand Islands. You can take a boat ride from the Marina. Describe life in Brockville. Many don't know it is a border town and you can see the States from right across the river. Yes, that is correct. If you go down to Block House Island or Hardy Park (both of which are located right next to the St. Lawrence River), you can see America. Brockville is a town that compared to some of the other areas in the province of Ontario is a bit on the small side. At last check, the population was 22,000. As far as the town itself is concerned, there is a lot of history surrounding it. We are home to Canada's first railway tunnel, and some of the buildings in the city's downtown core were built during the 1800s. Aesthetically, the town is absolutely beautiful...lots of parks, the court house square that is paved with cobblestones, the fantastic view of the riverfront. These are all things that make Brockville stand out. The only downside is that Brockville has been hit hard by the economy, and there aren't a lot of jobs available for people, so many have left to find employment elsewhere. But other than that, it's a nice little town. 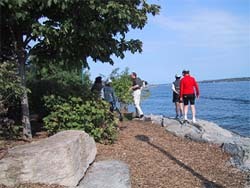 Hardy Park Waterfront Trail. The other side of the River is the United States. Would you ever consider moving to the big city, Ottawa, Montreal, Toronto or any other place? I probably wouldn't live in a major metropolitan city, just because it would be a bit too overwhelming for me. I lived in Ottawa (though on a university campus), and, I've visited Toronto and Montreal, and found the experience as a tourist fascinating, but completely different from a small town. One perk of larger cities is that there is never a shortage of transportation options, and there certainly is a lot more to do. But the trade-off is that you are constantly surrounded by noise, and I admit I like my quiet time to myself. As far as my foreseeable future goes, I'll likely be sticking around Brockville for now, but Kingston (which is about five times larger than Brockville) is a beautiful town too, and I could see myself living there as well. The Kingston/Brockville area has that balance between country and city living down pat. You have a french sounding last name. Do your parents speak french and is french any part of your life? My name is indeed French, but nobody in my family speaks French. I'm semi-fluent in French myself. I know enough to get by if ever I was lost on the streets of Quebec City, but I couldn't write an entire story in French. I took French all through my elementary and high school years, so that's how I picked up a bit of the language. You talk a lot about your sisters in your blog. Do either of them write? Not professionally. One works as an addictions counsellor, and the other one works at a financial services building. My sisters are also a bit older than I am. One is 15 years older than I am, and the other one is 9 years older. I often joke that my parents believed in the one child per decade rule, as all three of us were born in different decades. You know, come to think of it, my sister did have something published through her workplace. She helped bring in a new addictions recovery program in the area, and she had to co-write the manual for the program. In fact, I assisted her in helping her type it out years ago. Although all three of us are fairly skilled in writing, I'm really the only one who would like to do it as a full-time career. No, they don't. My father worked for CN Rail for 31 years, and my mother was a stay-at-home mom. You work at Walmart, and you aspire to be a writer. Did you ever have any other careers in mind? Oh, sure. When we're young, we all daydream about what jobs we'd like as adults. Before the age of ten, I think I wanted to be a fireman, an actor, a teacher...I even think at one time, I wanted to be the guy who pulled the lottery numbers out of the drum on television...LOL. But one thing that remained constant in my childhood was that I liked playing with crayons and pads of notebook paper...even more than the toys that I had in my toy box. So, I guess at an early age, I really had an interest in creating things, even if I didn't know it back at the time. You write a pop culture blog. Why pop culture? There's a couple of reasons why I chose pop culture. We all have our favourite movies, television shows, musical groups, and Saturday morning cartoons, and I think that by having a blog on these topics, it opens up some discussion about the topic itself, which is always nice to see. But I think a bigger reason stems from the fact that when I was growing up, my childhood was sort of a lonely one. I was bullied in school, and lived on a street that had mostly elderly people living on it. I mean, I certainly wouldn't recommend television or toys and games as a substitute for social interaction, not at all...but for me, it helped to think of the television shows and films that I enjoyed whenever I was feeling bad. I mean, everyone has memories of watching television with family members. One of my earliest memories was watching The Price Is Right at my grandmother's house, so any time I watch The Price Is Right, I think of her, you know? I do. I also have memories of watching The Price Is Right at my grandmothers house. It seems grandmothers watched a lot of Price is Right. Yes, they did...and my grandparents were also a fan of daytime dramas and talk shows, so I ended up watching them just because they did. I didn't necessarily know what they were talking about, but because they liked them, I watched them. And, the one thing that I find great about that is because I have these experiences with my grandparents, it gave me more topics to talk about in my blog. That was one goal I had with the blogging project...I wanted to have a wide array of topics so that a larger group of people could read and comment on them. You write one blog a day and have done that for over a year. How have you managed to keep a full time day job and pull that off? It's not easy, I'll tell you! The one blog post a day was a challenge to myself. I wanted to test myself to see if I could do it, and so far, I've been making it work. I do most of my writing on my days off. In some cases, I'll work on two blog entries at once if I know that my schedule will be hectic. It's hard work at times, but I find I'm getting better at it. If you had to show one blog to anyone to show what you can do, what blog would that be? I suppose if I had to choose a particular entry to showcase what the blog is all about, I would probably go with any of the ones that talk about overcoming a challenge, or one where you learn a life lesson. There's one entry that I wrote back on August 7, 2011 that talked about the Coolio song "Gangsta's Paradise". It had some info on the song itself, but it also ended up being a significant song in my own life. In that entry, much like other ones I've done, I bring up a personal life story and tie it to the pop culture item itself. And, that's just one example. I have others detailing health scares, job stories, and other miscellaneous items. But the one I pointed out is probably one of my better accounts. You usually mix several elements into every blog. Facts about the topic, an introduction which relates your personal interest in the topic and a point or anecdote which you setup for the end. Any thoughts to why you do it this way and how that developed? The blog is basically an exercise in self-awareness and self-taught life lessons that stem from these pop culture references. Whenever I do a blog entry, I try to highlight these lessons in hopes that other people will be able to see it too. But even if they don't, that's okay with me, because if I can find at least one life lesson that I can apply to my own life with the topic of discussion, then I call that a success. The trivia points and bonus questions that I sometimes include are to encourage discussion about either the topic itself, or the life lesson included within. Do you have the aim to be a story writer as well, and if so do you have anything in the works? You have talked extensively about your experiences with bullying. In the present, other than writing, do you do anything to try and stamp out bullying? Oh, absolutely. Aside from talking about it in my blog, I started up a Facebook group which is called the "Gallery of Healing". It was originally designed as a creative outlet for people to express their thoughts about bullying, or just to talk about their own experiences. It's not a very big group, but it's there in case anyone needs a place to go where they won't be judged. I also have joined other groups on Facebook to talk about my own experiences, and I find that the more I talk about it, the more I can accept that it happened, and I can begin my own healing process. Do you have any formal training as a writer? Other than attending a few college classes, not really, no. When I was in high school, my course load was more English/History based than Math/Science, so I was definitely exposed to more writing than some other people at my school. Describe a typical blog, from start to finish. What's involved for you? How much time does it take? What methods do you use for research? Well, first, I check and see what day of the week it is...I know it sounds strange, but because I have different theme days for my blog, it makes a difference. It takes me longer to do a Thursday Confession than it does a Sunday Jukebox entry. And, Tuesday Timelines are the entries that involve the most research, so they take a while to do. Typically speaking, the average blog entry takes me a few hours to write. Some I've done in less than two hours, while others have taken me at least eight. As far as research goes, I tend to hit Internet Movie Database a lot for background information, and sometimes I'll use reference books or pop culture themed magazines for info. But the best research I can do is actually watching the film, or reading the book, or listening to the song that the topic is about. I did an entry on "My Girl" recently, and I was watching the movie while I was typing the entry. Other than facebook, how do you promote your blog? Well, I did have a Twitter account for about six months as a tool for promoting the blog, but I gave that up, as I am not a fan of the site. But, I admit that I have posted links to my blog on discussion forums (with the webmaster's permission, of course). Other than that, I'd say that Facebook is the main source of promotion for my blog. You have discussed your illness from 2011. How has that changed you, if it has at all? It's changed me a lot. For those reading this interview that may not know, in February 2011, I had my gall bladder removed. The surgery was incredibly complicated, as my gall bladder was so infected that it started to infect other organs. Had I let it go any further, it would have killed me. When you're in a situation like this, it changes a person. Physically speaking, I'm doing fantastic aside from a huge scar on my chest. But emotionally speaking, it made me realize that life was short and that I really should start living it more. Slowly, but surely, I'm getting better at not sweating the small stuff and living the life the way that I want to...not the way anyone else did. I think as well, the health scare showed me just how much people liked me, and what real friendship was. Before the surgery, I wasn't sure if I had such a thing, but all the phone calls and visits, and get well cards that I received during my recovery made me realize what the true value of friendship was. So, while the surgery was one of the worst things that happened to me physically, emotionally, it was one of the best. You focus a lot on music in your blog. What does music mean to you and do for you? Well, I'm sure you've heard the saying that music is a universal language, and I tend to agree. Music has the potential to awaken every possible emotion out there. Fear, Joy, Love, Pain, Sorrow, Anger. Most everyone I know listens to music in their daily activity, so I wanted to really put a special focus on including a lot of music in my blog. And besides, some of the craziest stories out there in pop culture involve the music industry, which makes for more interesting reading. Wow...let's see. Richard Marx, Tom Petty, The Beatles, The Rolling Stones, Steely Dan, U2, Duran Duran, Queen, some of Madonna's early works are quite good. I also have Kylie Minogue as a guilty pleasure artist...her songs are catchy and have a good beat, and she's very nice to look at...LOL. A lot of the artists I've named have either been featured in the blog or will be featured in upcoming entries. You have a love of comic books, tell us about that. Sure. My comic book tastes didn't involve the superhero comics like Batman or Superman, though I did read a few growing up. I tended to gravitate towards Archie comics in particular. My mom bought me my first one when I was five, and I was hooked instantly. I now have a collection in the thousands. It's one part of my childhood I refuse to give up. The world of Riverdale (where the Archie universe is) was always a positive place where everyone accepted each other no matter what kind of person you were. It was comforting to know that whenever I had a bad day in school, I could always escape into the world of Archie comics and feel like I belonged. And, certainly everyone does belong. There are African-American characters, Asian characters, characters with physical disabilities, and a couple of years ago, Archie comics introduced their first openly gay character. And, the common theme is that everyone gets along no matter what. It's a lesson that sometimes I wish the whole of society could get at times. That is all the questions I have. Anything else you wanted to bring up? I actually just wanted to take the time and thank everybody out there for reading "A Pop Culture Addict's Guide To Life". It's been a great experience for me to do this blog, and I hope that everyone has had fun reading it! If it wasn't for my readers, I wouldn't continue to do this blog, and I'd personally like to appreciate all of them for the topic suggestions and comments. Stay tuned to the blog for the remainder of the month of May. May is the anniversary month of the blog, and I have some surprises planned.